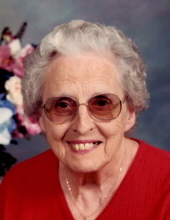 Wanda Rose Weger of Flat Rock, IL, died at 5:51 p.m. on April 9, 2019 at Riva Ridge Memory Care in Leander, TX. She was born March 23, 1922, in Duncanville, IL the daughter of James William Love and Elizabeth (Rush) Rich. She married John Weger on October 18, 1946, and he preceded her in death on June 26, 2015. She was also preceded in death by her parents; her brother, James William Love Jr.; her step-brothers Jerry Rich and Veris Rich; her step-sisters, Virginia Decker and Anita Rich; and her grandson Robbie Weger. She is survived by her children, Gary (Elvena) Weger of Round Rock, TX, Janice Rigg of Evansville, IN, Rick Weger of Flat Rock, IL, and Terry (Stephanie) Weger of Portland, OR; as well as 7 grandchildren, 12 great grandchildren and 4 great-great grandchildren. Anyone who knew Wanda will remember a woman who selflessly gave her time, energy, and love to those around her. When her children were young, she dedicated herself to raising them in a warm, caring home. She would eventually work as the special education school bus driver for Crawford County for 17 years, work that she absolutely treasured. She was also a very active member of the Flat Rock United Methodist Church, and was a staple throughout her many years of attendance there. Quilting played an important part in Wanda’s life as well. Whether at home or in her quilting group, every stitch was made with the same love that lives on in her family’s hearts today, as it will for years to come. A visitation will be held from 5:00-7:00 p.m. on Wednesday, April 17th at the Goodwine Funeral Home in Flat Rock. A funeral service will be held at 10:00 a.m. on Thursday, April 18th at the funeral home with burial following in the Tohill Cemetery, rural Flat Rock. To send flowers or a remembrance gift to the family of Wanda Rose Weger, please visit our Tribute Store. "Email Address" would like to share the life celebration of Wanda Rose Weger. Click on the "link" to go to share a favorite memory or leave a condolence message for the family.